After a visit with the doctor yesterday for our 34 week check up, it turns out that little Miss Booth is breech. I think she got this way about 3 days ago when I became even more uncomfortable then before. What I thought was her bottom sticking up into my ribs is actually her head. Hopefully she'll find her way downwards and get back into a position more conducive for birth. The Doctor said that 20% of babies are breech at 34 weeks, 7% at 36 weeks and 3% at birth. There is a good chance she'll rid herself of this problem. Kenny reminded me that right around this point Shane also went breech briefly, but corrected himself quickly. She is measuring in at 5lbs right now which puts her in the 40%. She continues to grow and do well. Back to the Doctors in two weeks to hopefully find out she isn't breech any more! We'd like to give a warm welcome to the newest member of our extended family. 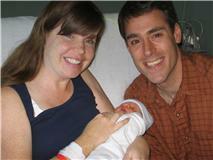 Grant Charles was born to Kenny's sister Aimee and BIL Chris on September 23rd at 7:01pm. He weighted in at 7lbs and 5ozs and 20 1/4 inches long. Baby Grant is such a good sleeper he has to be waken up to be feed. All three are settling in nicely at home. Sunday afternoon Baby Girl Booth and I were blessed to have the most beautiful baby shower ever. Julie and Tia had our house decked out in lavender and purple decorations, food and candy! It was a purple paradise. The yummiest cupcakes ever. But those weren't the only sweet yummy things we had to eat: key lime pie and chocolate mouse cake. If you had a sweet tooth this was the place to be!! This beautiful baby banner was made by Tia. It will take up a permanent place in the baby's room. Along with the cutest tissue paper balls Julie made hanging from the ceiling. Which will also make their way into the baby's room. We were blessed with many wonderful gifts: clothes, toys, blankets, etc. All of them cute and fuzzy. But I must say this little purple and green dress was my absolute favorite! I want to just frame it and hang it up in her room. Thanks Lynette for breaking your "No Gymboree" rule for this little treasure. Shonda and I with our "matching" bellies. Due just 2 days apart. Both girls. A big thanks to everyone for making this such a special and fun day! I whipped myself up a little infant car seat cover the other night. Okay....I might not have "whipped" it up. It took a total of two nights to complete. Oh....it might not be the most perfectly stitched thing around, either. But none-the-less, I made it from scratch with my own little hands. You might ask why? an infant car seat cover. I know a lot of people just drape a blanket over the car seat while little baby is sleeping. But I thought this made so much more sense with the straps on the top to hold it up and in place. Plus, if you don't want any one peeking at the little one (germs or for sleeping reasons, etc) it just makes for a nice privacy cover as well. I was inspired by a friend who recently made one. (Thanks Katie!) I even had plans to make a couple for baby gifts, but now I'm not so sure I will be doing that. It wasn't hard per say, but getting the straps on the top was defiantly a step up on my sewing skill level. I have also decided that sewing isn't the hard part. It's working with the darn sewing machine to get it threaded, the bobbin in, the thread through, and so on and so on. If the darn sewing machine would cooperate, this sewing thing would be a breeze! Next up for my sewing projects: maybe two more of these things, but for sure cloth baby wipes to go with our cloth diapering. Here is the link to the pattern that I followed, with a few changes I made to mine. I didn't make mine all fancy either. I thought I would start with simple and go from there. We've seen some success and some failures with our garden this year. I didn't have huge expectations for it, but am happy with what we did produce. Just yesterday we ate our very own broccoli and carrots for dinner. We have even had 3 gorgeous red strawberries get picked in the last couple weeks. The snap peas grew like crazy. Sadly, no one in our house would (Kenny and Shane) or could (myself) eat them. I was able to pass those yummy things onto friends and family. The carrots seem to be slow, but we have pulled out about 4 good sized ones up to this point. We even have one small cucumber growing on our one sad cucumber plant. I haven't picked him yet, but he is looking great!! Two of my biggest disappointments were the tomatoes and pumpkins. We only had one bush produce ripe tomatoes. That Shane loved to eat. The other 4 were completely full of green tomatoes, but they just never ripened. Our pumpkin plants don't look like we'll be getting any pumpkins at this rate. They grew nicely. We had a ton of flower blossoms on them. But I just don't see any sign of a pumpkin. Next year I think we'll skip the snap peas, broccoli and pumpkins. Have less tomato plants (5 this year was just too much in size). And go with "regular" carrots. This year I thought the pretty multi-colored ones would be fun, but they are growing so slow. We won't need to add any strawberry plants, because those have multiplied like crazy! I think it has been a great experience for Shane. He loves to come over to the garden and see what has grown and is ripe. Two weeks ago Shane started playing soccer through our local community center/parks and rec. I was out of town for the first practice/game, but was able to come along this past Saturday. Kenny had told me all about it, but now I got to see with my own eyes. I hear that there was a slight improvement from the first time, but man, that little monster is a tough case to crack. He just does not want to be out on the field to play. He did some warming up with the coach and team. We even got him on the field twice at first during the game, but the moment the "action" got to close to him, he ran to the sidelines crying. The next morning I showed him a video of his buddy Lucas playing soccer. He really liked watching it. When I asked him if he wanted to play soccer like that he said "No, I get hurt." Bossing Daddy around while they warm up. Actually running around and kicking the ball before other kids showed up. Most of the time he has his tongue sticking out while he does that. Kicking goals in with other teammates around. A BIG improvement from last week. Stretching with his team. A little off task, but still near other kids and attempting to participate. Deciding that he doesn't want to play in the game. They switch out players every 5 minutes or so. This is what it looks like when Shane "plays". He stays as far away from the ball and the kids as he can. This is what happens when the "action" gets too close for comfort. Mommy to the rescue. Summer seemed to keep me away from Menu Monday's. We did eat dinner every night, but it certainly is easier with a menu planned ahead for the week. Otherwise, it seems that I think about what is for dinner all day long. I kept wanting to get back in the swing of things, but it just hasn't happen. Let's see if this week it will. The parents were given this poem at Shane's preschool orientation. I thought it was really cute. When children come home at the end of the day. "Tell me, what did you do today?" "Nothing, I did nothing today!" or counted to 10 with Mrs. Cox. or heard a story about a mouse that flew. or went outside on the swings to play. or played with a special brand new friend. NOTHING can mean so many things! Shane is now going on his 3rd week of preschool. I am so proud of him. I absolutely love picking him up and hearing about all his tales from the day. At this point he is still having a rough time in the morning saying how he doesn't want to go to school and that he isn't a big boy any more. When I drop him off there are still tears, but I hear they only last for a minute or two. Lamb Chops appears to be put into the bag as soon as he gets to school and he didn't even have Lamb Chops out while he waited for me to pick him up the other day. Big progress on that end of things. I hope soon to have Lamb Chops stay in the car with Blanket. When I do get him he is so happy to see me I get the biggest hug ever. He is just beaming with all the things he did at preschool. He won't use the bathroom at school. He says he doesn't know where it is, but really I think he just doesn't want to use it. I am just waiting for the day I come to get him and he is in his back up clothes. The first snack time he told me he wasn't given snack. But a few days later it turns out he just didn't like snack, so he didn't eat it. He also told me today he didn't drink his apple juice because it is in a big boy cup and he didn't want to spill it. We practiced drinking from a big boy cup at lunch. Which he can do with out a problem. I hope this will help with snack time at school now. He has all of his teachers names down (there are 4 of them...one for each room and an assistant for the art room). The first time he played on the playground he said he didn't play and sat on the bench with the teacher. Kenny and I laughed about this. We both truly would love to watch him at school with out him knowing we were there. At home the other day he asked to do a project while he showed me his scissors and glue he had found. When I got the stuff all set up and had the glue on a plate for him to spread with q-tips (makes less of a mess and we did it that way at Toddler Group). He totally lost it and said "We don't do it that way at preschool!!!!" Those are just a few things that have come out as the days go on and we hear about preschool. I have found it hard to relinquish not knowing everything he does for 2 hours on those days. I desperately want a play-by-play from the teachers about what he says and does the whole time while there. But I guess that is what I have to learn from preschool this year. To let go of my baby boy just a little bit for a couple hours a week. Last weekend marked the 3rd annual scrapbook retreat weekend. For the last 3 years a number of my fellow scrapbooking friends have headed down to Auburn (about 45 minutes from where we live) for a weekend of scrapping, chatting, eating and just having fun. The food is prepared for us by Katie, the owner of The Keepsake Cottage. And I love the part of going to bed when I want and getting up when I want. Granted I usually come home sleep deprived since staying up until midnight and getting back up at 7:30 doesn't allow for me to really catch up on my sleep. But it is all about getting those scrapbook pages completed. This year I hit a big goal. I am "current" on my scrapping. Meaning that I basically have all the events and pictures scrapped that I have taken up to this point. I completed a total of 66 pages this year and I even had a couple hours left before I had to come home. What a feeling. I really wanted to be caught up before the baby arrived so that I can focus on getting her baby book completed through out the coming year. I can't wait until our next retreat weekend in a year from now. It is the best break ever. I am very thankful to Kenny and Shane for making it through the weekend with out me with flying colors!! We took Shane to his annual Mariners baseball game Wednesday afternoon. When I told him we were going to a baseball game the first thing he asked is if we were going to see the Hot Dog guy. Which we saw at the Everett Aquasox game this summer. He was greatly disappointed when I told him no, but I quickly followed up with we would see the Moose. Thinking in my head....I sure hope we see the Moose! Well surprise, surprise. Shane got to have his picture taken with the fuzzy guy. Kenny said that he had never seen so much love in Shane's eyes before. This kid LOVES people in costumes!! Our center field bleacher seats. The place to go when you have a wiggly 3 year old that really doesn't watch the game. Watching the pitchers warm up. He said this was his 2nd favorite part (1st being the Moose). We also went down to the other end of the pitching mound to see the catcher catch. Which he just loved the sound of the ball hitting the glove. The catcher even waved at him. Which brought a huge grin to his face. Watching the pitchers chat before the game. He gave one of them a fist bump after this. A little boy in baseball heaven. Or maybe it was a Daddy in baseball heaven. 8 months down and 2 more months to go! Whoa! Not that I am counting or anything. Time seems to have come to a crawl though. I am trying to take it as a blessing to get more things done and have more one-on-one time with Shane. Really I just want to be done being pregnant. Guess that means I am ready to trade in the uncomfortableness of pregnancy for sleepless nights and all things infant. We did it! Shane and I made it through the first day of preschool. It may have only been orientation, but he did have to stay by himself for 1 hour. The hardest part for me was walking away as he cried (and he wasn't the only one crying). But I'm super excited for him to go, because I think he will have so much fun and learn so many new things. I smiled just looking at the September calendar and all the new things that he will learn about and do. Thursday will be the first full day. Real drop-off and all. Two hours and 15 minutes with out Mommy. I'm sure Lamb Chops will be in tow for the next few months. 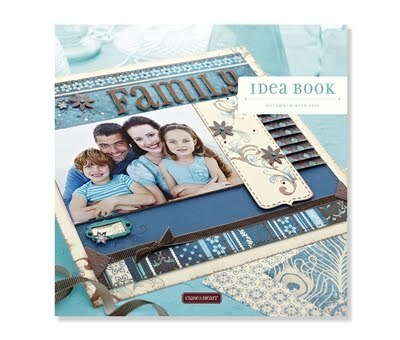 The Autumn/Winter 2010 Idea Book Has Arrived!! It's September and that means a new Idea Book from Close To My Heart. View it online here or if you would like your very own to look at over and over again all you have to do is book a gathering with me or attend a workshop. 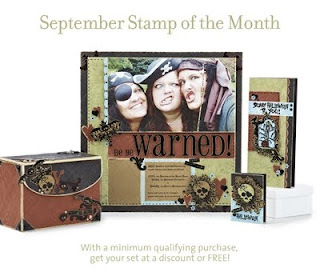 A new month also means a new Stamp of the Month. This months stamp is called Thriller. 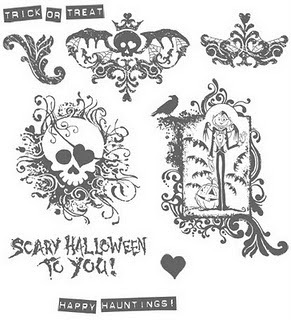 It will be perfect for all those fun upcoming Halloween events. You can even earn it for FREE or purchase it at a discount.